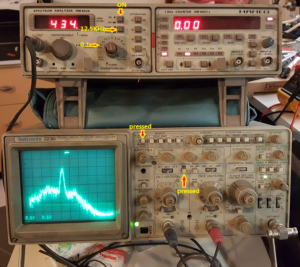 The setup to use the HAMEG Spectrum Analyzer HM 8028 connected with the TEKTRONIX 2230 oscilloscope is very simple. Below there is the setup for receive an ASK 434MHz signal. This entry was posted in WireLess & Networking. Bookmark the permalink.